In today’s work environment, many of us feel pressured to work faster, harder and longer hours. It’s easy to allow our jobs to become our lives. For many, this can lead to burnout, resulting in decreased productivity and dissatisfaction, among other things. 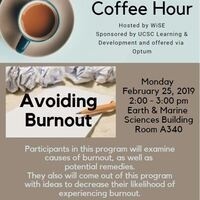 Participants in this program will examine causes of burnout, as well as potential remedies. They also will come out of this program with ideas to decrease their likelihood of experiencing burnout. Please register early! In the event of a class cancellation due to low enrollments, registrants will be notified at least 3 business days in advance and placed on the waiting list for a future offering. For accessibility-related inquiries, please contact LearningCenter@ucsc.edu.